I graduated in Physics back in 1999 (!) at the University of Padova (Italy), with a specialisation on theoretical high energy particle physics. I then joined New York University for my Ph.D. (2001-2007), which was in David Grier‘s group at CSMR, working on colloidal interactions measured with holographic optical tweezers (experimental!). In 2007 I started working with Raymond Goldstein at DAMTP, Cambridge, on biophysics at the cellular level. I have been lucky enough to be sponsored first by a Marie-Curie Fellowship (2008-2010), then by an EPSRC Postdoctoral Fellowship (2010-2013). I joined the Physics Department in Warwick in September 2013, and I am currently an Associate Professor. Since February 2016 I am an Associate Member of Warwick Integrative Synthetic Biology Centre. In December 2016 I joined the Centre for Mechanochemical Cell Biology at Warwick as Group Leader. Since September 2018 I have a joined appointment with Warwick Medical School (70/30 Physics/WMS). My Researcher ID is H-4202-2011. You can also check my profile on Google Scholar. 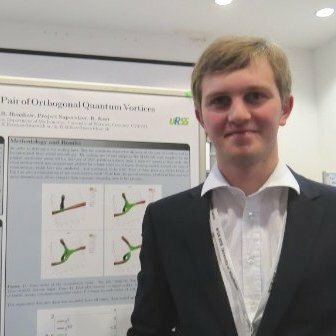 Richard graduated from the University of Warwick in 2015 (MSc Physics). He joined in September 2015. His Ph.D. is focussed on motility of the globally disperse marine pico-eukaryote Micromonas pusilla (the smallest known eukaryotic microorganism…. and it moves!). Mira graduated from the University of Eastern Finland in 2016 (Environmental Biology). She joined in September 2017 as a MIBTP Ph.D. student. During her Ph.D. Mira will work on the interaction between marine microorganisms and plastic microparticles. She is co-supervised by Joseph Christie-Oleza. Iago graduated from the University of Santiago de Compostela in 2015 (Physics). He joined in September 2017 as a MRC DTP Ph.D. student. During his Ph.D. Iago will work on the relation between bacterial motility and antibiotic exposure. He is co-supervised by Munehiro Asally. Lewis graduated from the University of Warwick in 2017 (Master in Physics). He joined in July 2017 on a Leverhulme-funded project to work on tip-tracking proteins and intracellular force generation by microtubule polymerisation. He is co-supervised by Anne Straube. Steve graduated from the University of Warwick in 2018 (Master in Physics). He joined in September 2018 to work on dynamical properties of pure and mixed active matter suspensions. Jack Parker and Weronika Raszewska (MSc Final year project). Matteo Contino, Ph.D. student (graduated 2017). George Parry, MSc-R student (2016) and Integrate AMR Fellow (Jan-Sept 2017). Raphaël Jeanneret, joined PDRA with Vasily Kantsler (2014-2017). Currently ‘Margalida Comas’ Fellow at IMEDEA in the group of Idan Tuval. Kate Watkins, MRC DTP student (3 months rotation, 2017). Currently PhD student with Meera Unnikrishnan. Julia Dölger, Ph.D. student with Anders Andersen at DTU Denmark (April & May 2017). Javiera Leemhuis (URSS Summer 2018). Freya Bull and Sophie Mount, 4th year project, a.y. 2017-2018. Jonathan Roberts, URSS Student; and Simone Coppola, Summer Student (Summer 2017). Semih Svasal, BSc final year project (Oct 2016). Rory Claydon and Jonathan Benarroch, URSS Students (Summer 2016). George Day and Arun Jaspal, BSc final year project (Oct 2015). Chris Norman and Matthew Painter, MSc final year project in collaboration with Munehiro Asally (Oct 2015). Matthew Lloyd and Jake Haynes, URSS students (Summer 2015). Richard Henshaw and Dean Walker, MSc final year project (Oct 2014). Joanna Craufurd and Charlotte Macken, BSc final year project (Oct 2014).